This nine-part model demonstrates the major anatomical regions of the human brain. Students can remove each region to examine them more closely. 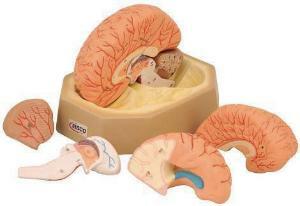 Removable regions include the temporal and occipital lobes, brain stem, cerebellum, and the basilar artery. Blood vessels are visible throughout the entire model.